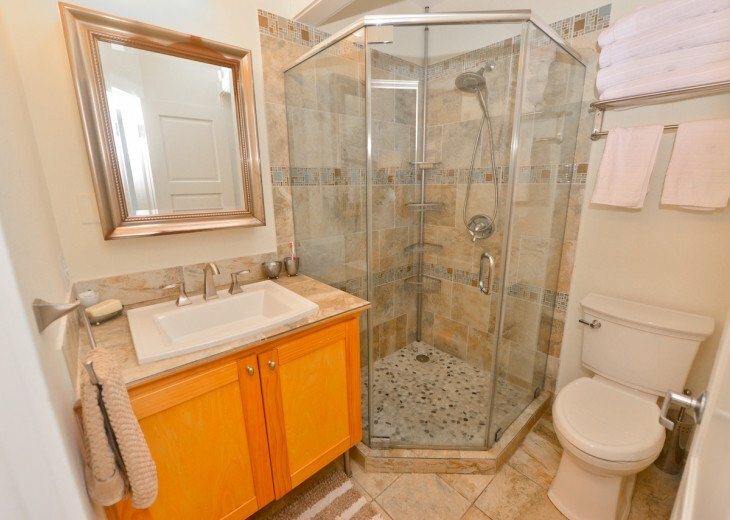 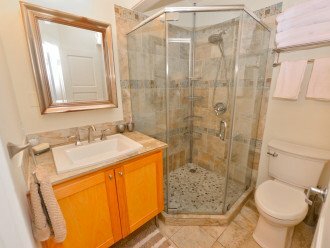 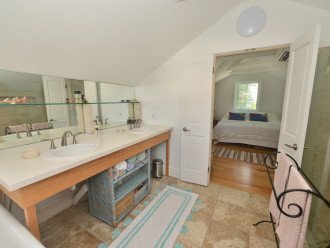 full bathroom with bathtub and double shower. 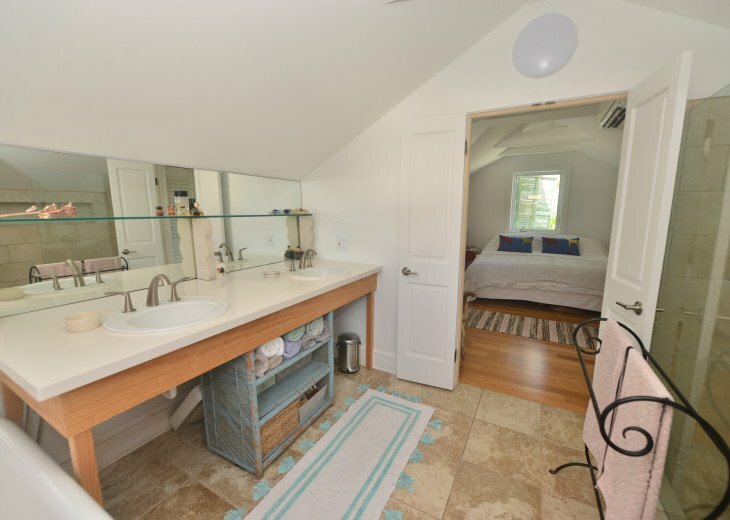 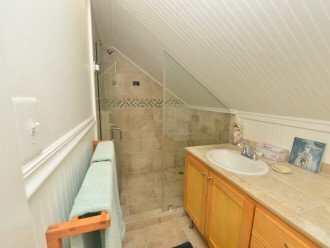 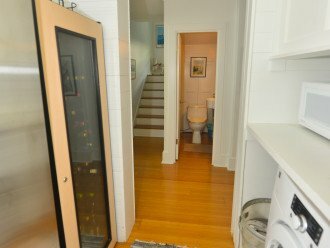 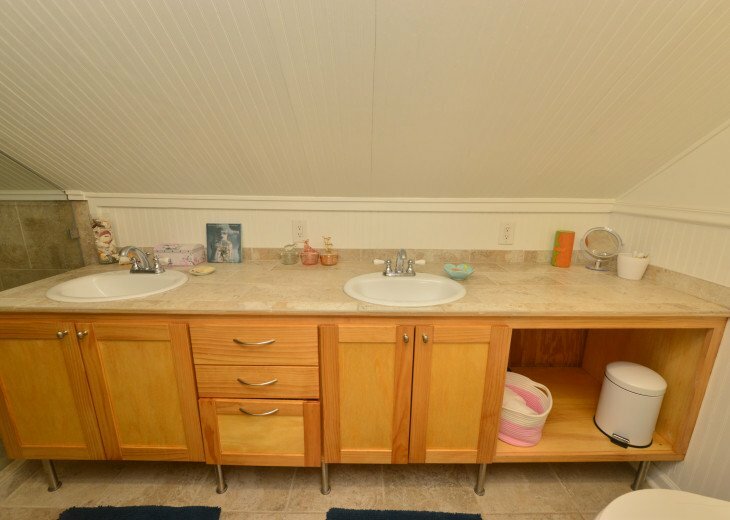 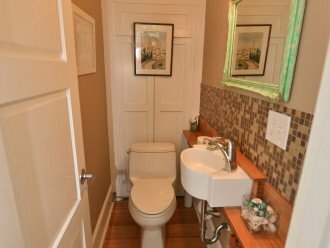 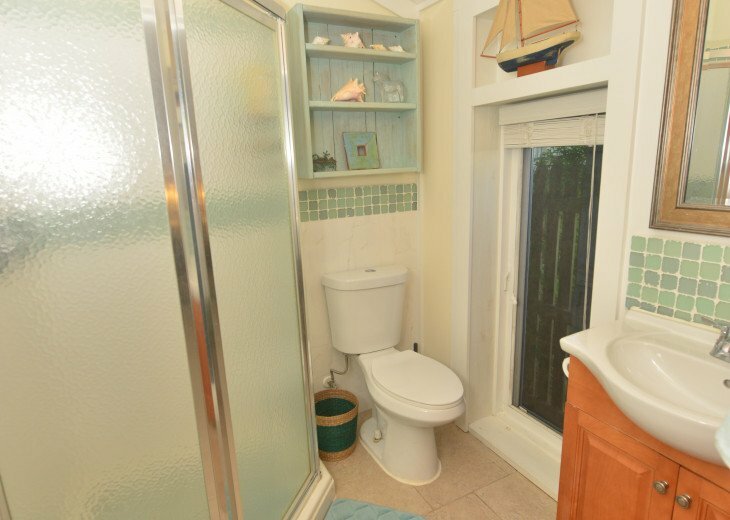 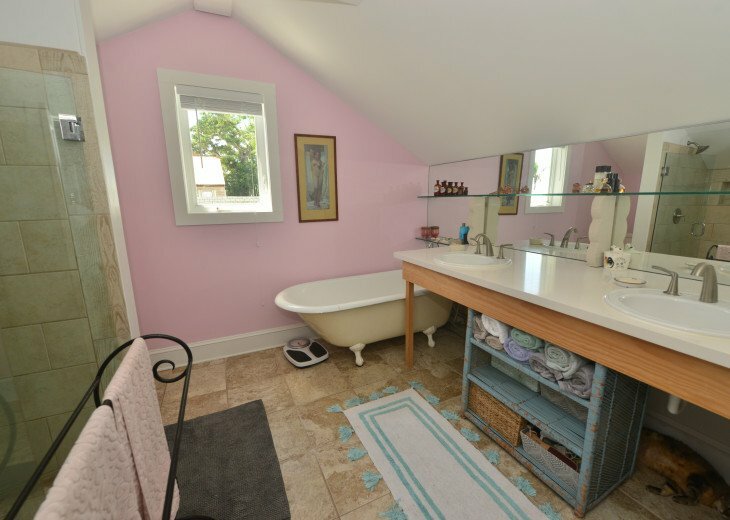 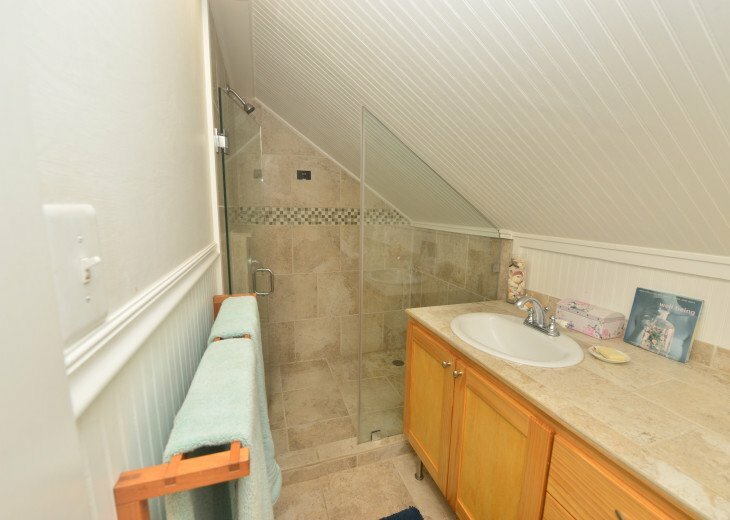 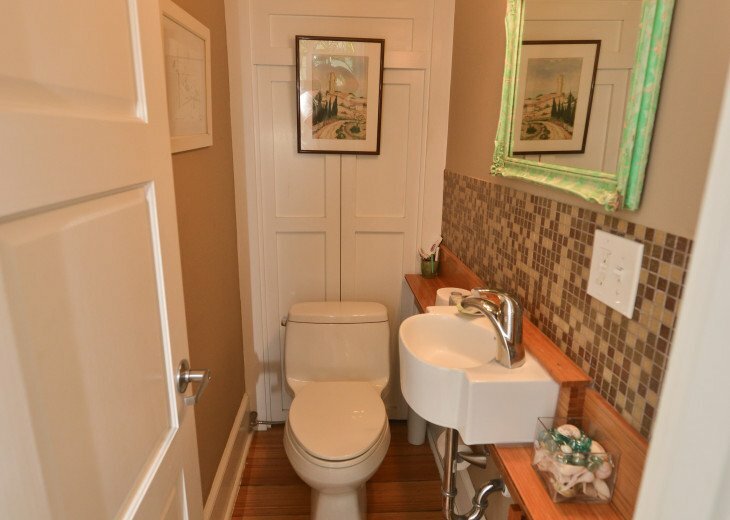 bathroom for the bedrooms upstairs. Monthly rentals only. 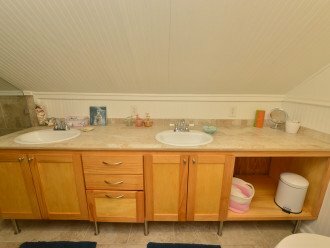 28 day minimum. 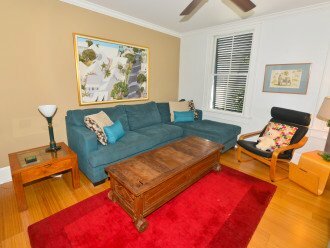 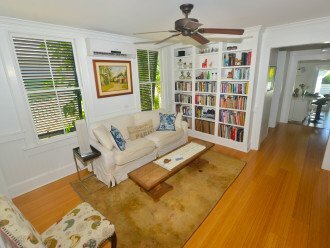 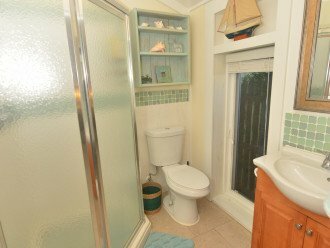 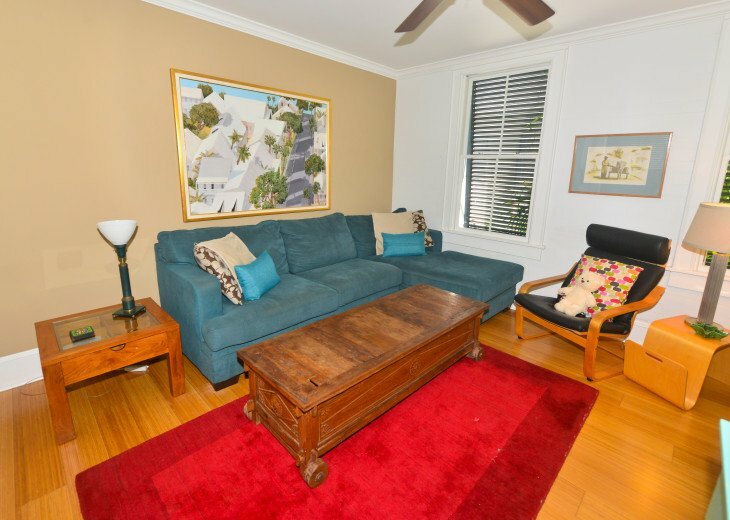 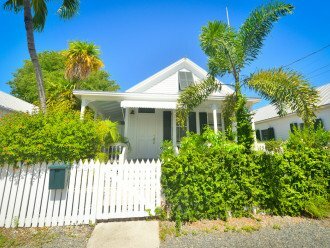 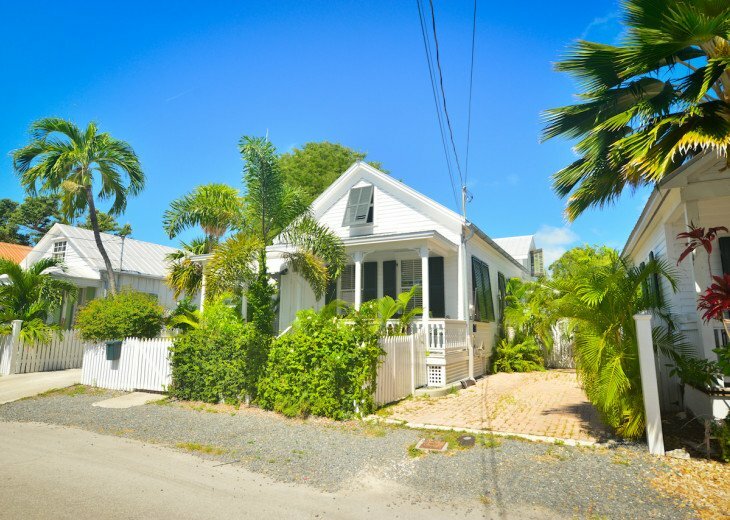 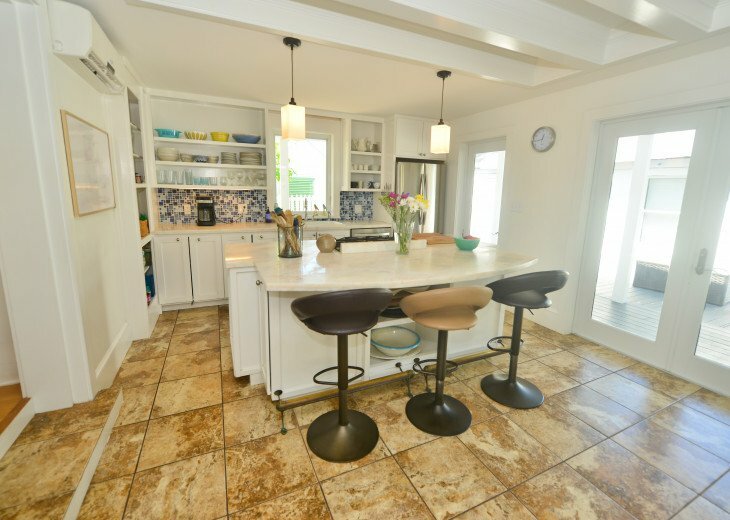 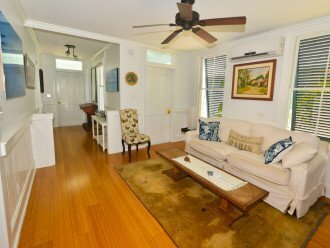 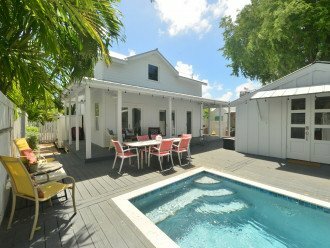 This single family home is perfectly located in old town two blocks away from the southernmost point and one block away from Duval street. 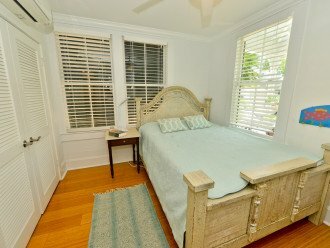 It has 4 bedrooms in the main house and a separate guest cottage with a bedroom and a full bathroom. 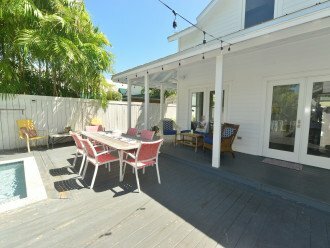 It has two off street parking spaces, a wrap around front porch and a large back deck with a pool. 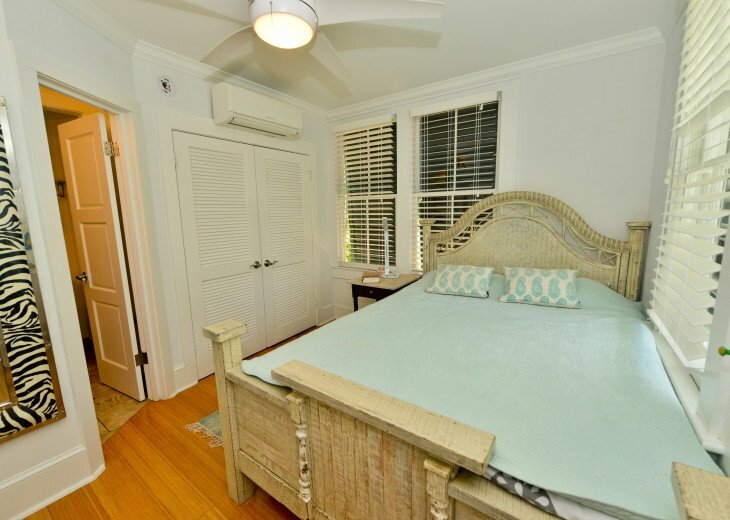 The main house has a bedroom downstairs with a queen size bed, large closet and en suite bathroom with a shower. 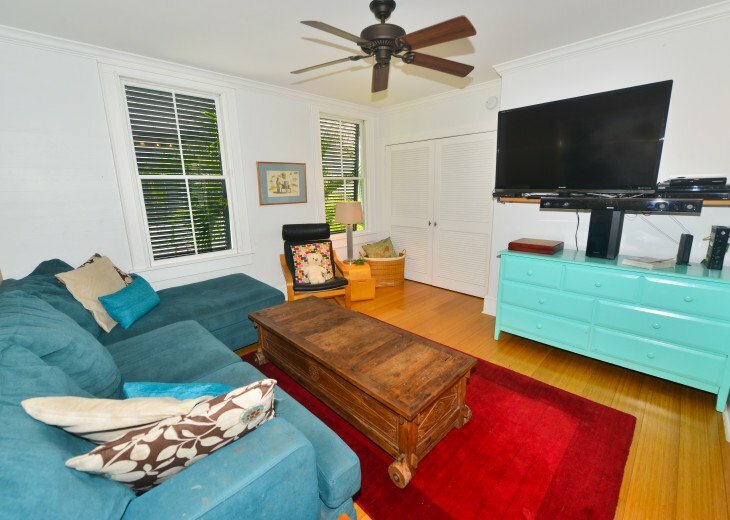 Downstairs we also have a lovely sitting room as well as a comfortable living room with a flat screen TV. 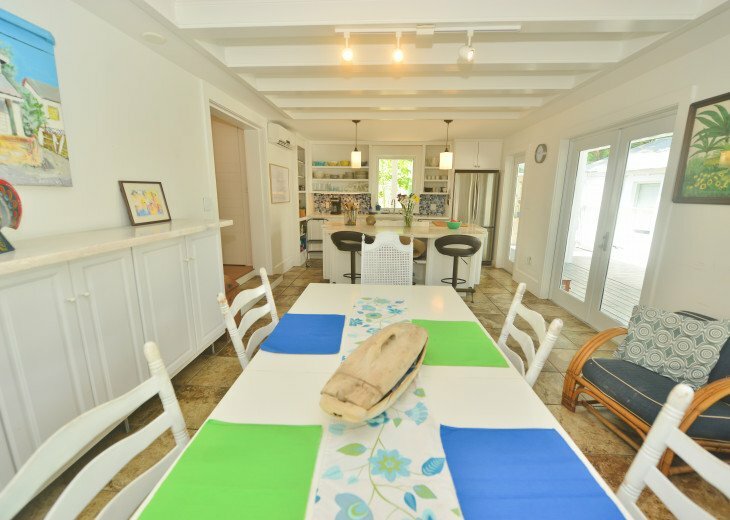 The kitchen/dining room is open plan which opens up to the back deck which also has a dining table and seating area. 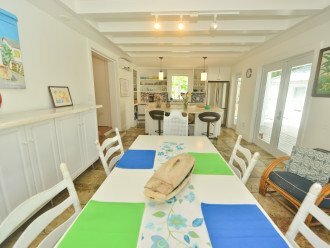 The kitchen is well stocked with all the amenities needed for a long stay in the tropics. 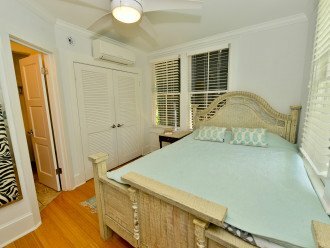 The master bedroom is upstairs which has a king size bed as well as a large bathroom with a double shower, bathtub and double sinks. 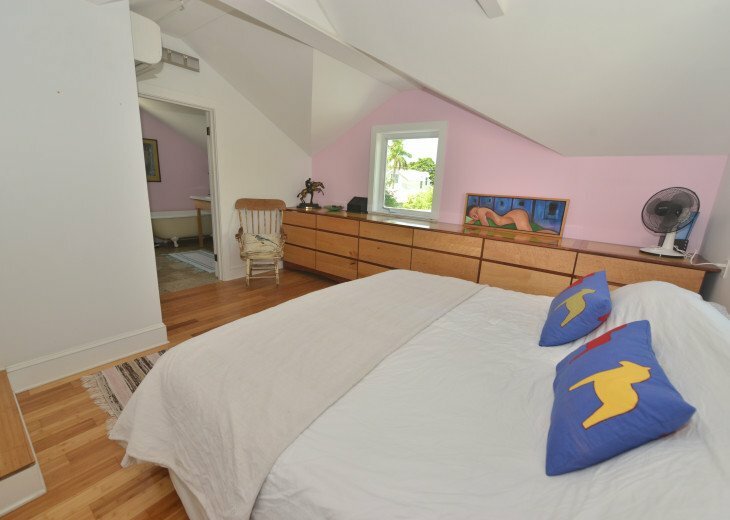 Upstairs we have two smaller bedrooms, one has a full size bed and one has a queen size bed. 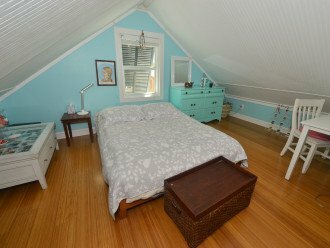 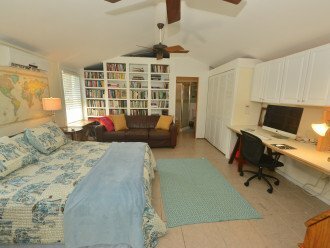 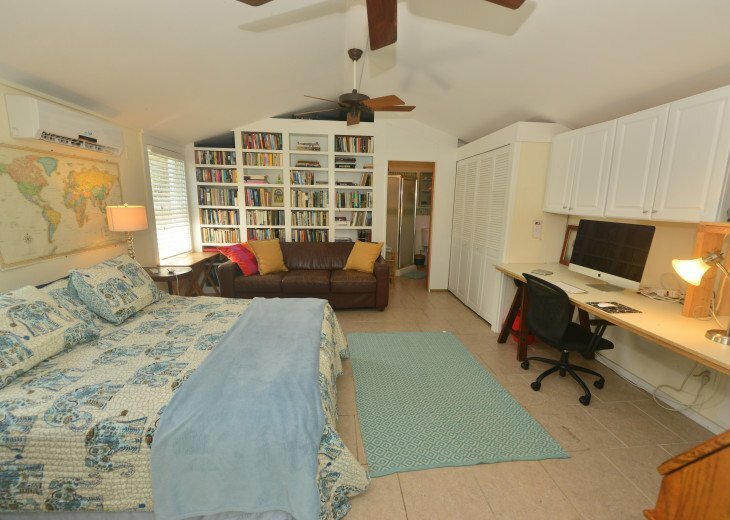 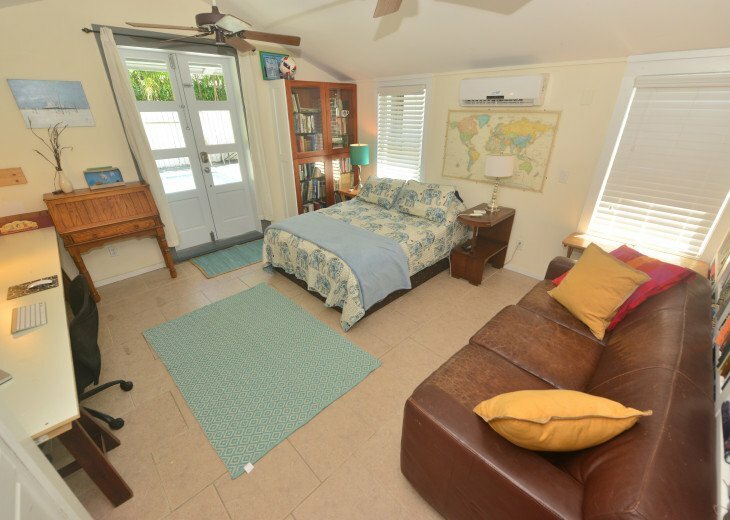 The cottage has a queen size bed, large flat screen TV as well as a couch and a library. 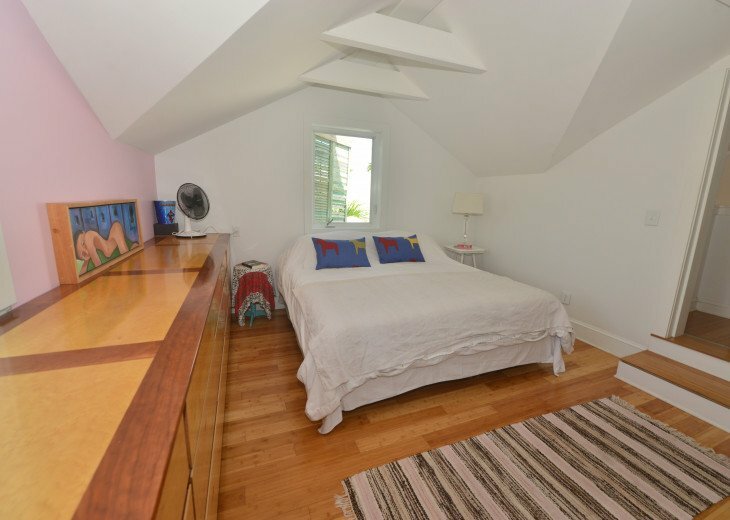 The house is light and airy, very comfortable and the location is amazing. 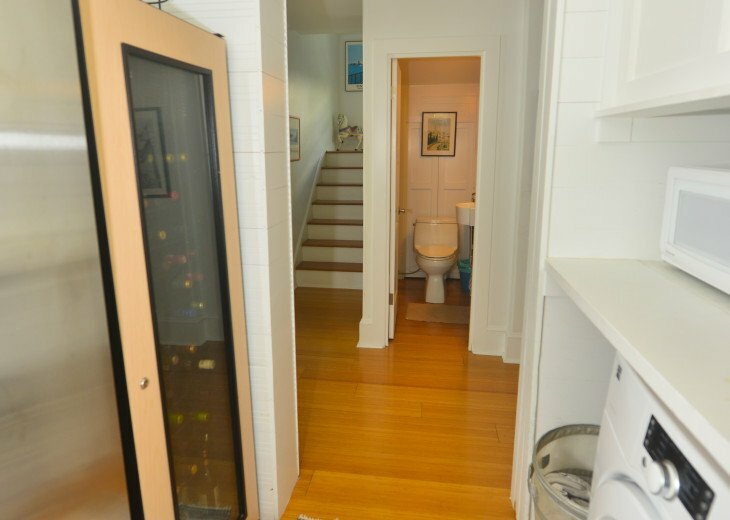 The location of this property is outstanding. 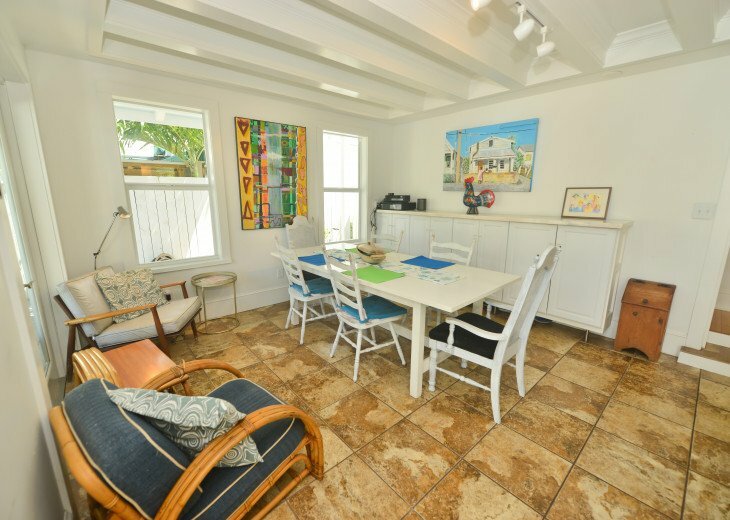 You can literally walk to your favorite restaurants, shops entertainment and beaches. Our neighborhood is lovely and slow-paced even though it is so centrally located. 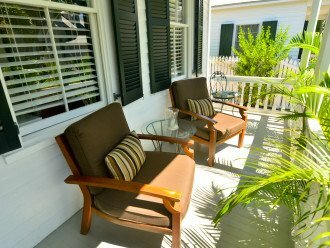 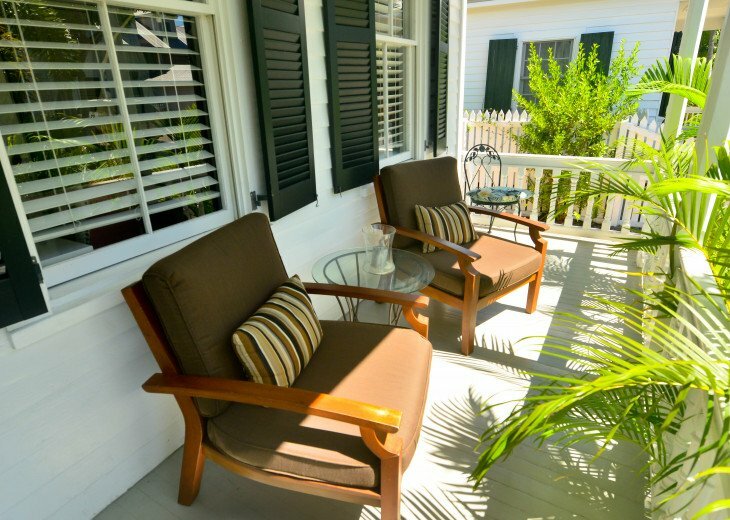 Sit on our beautiful front porch and watch the world go by or hang out by the pool in the back. 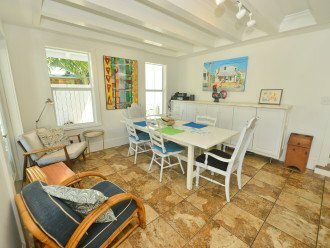 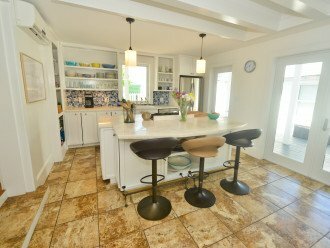 The separate guest cottage makes it ideal for 2 families to travel together or have your family join you for part of your stay. 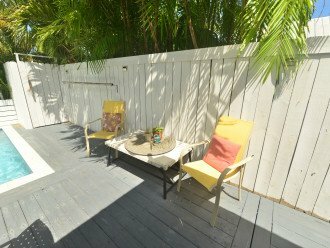 If you like swimming there is a public pool across the street as well as parks. 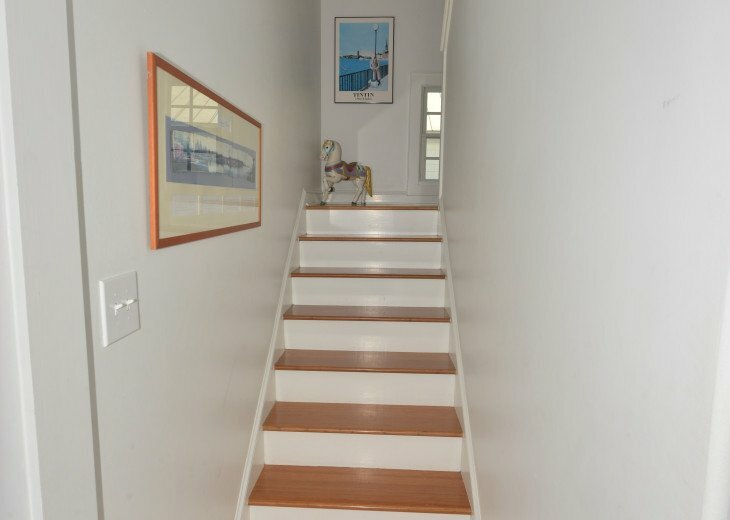 We are pet friendly [dogs only]. 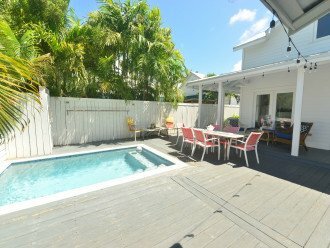 There is a kids playground down the street, pool and basketball court. 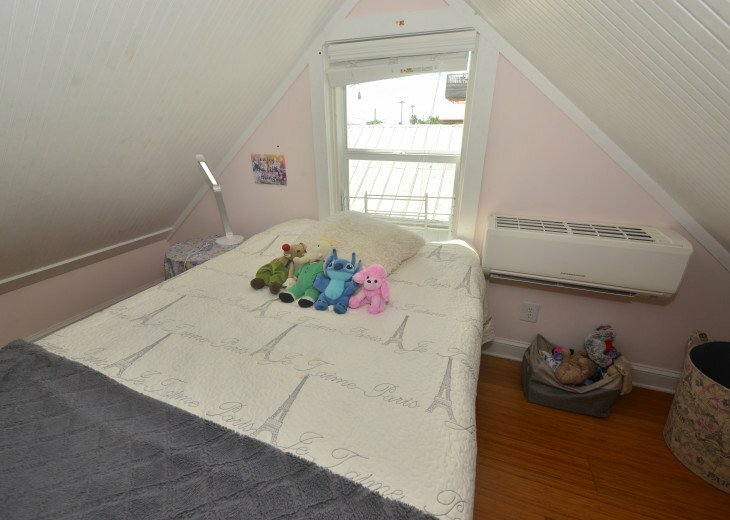 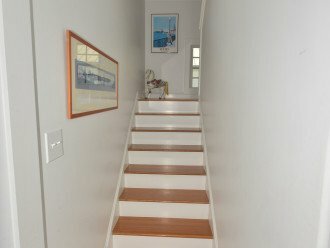 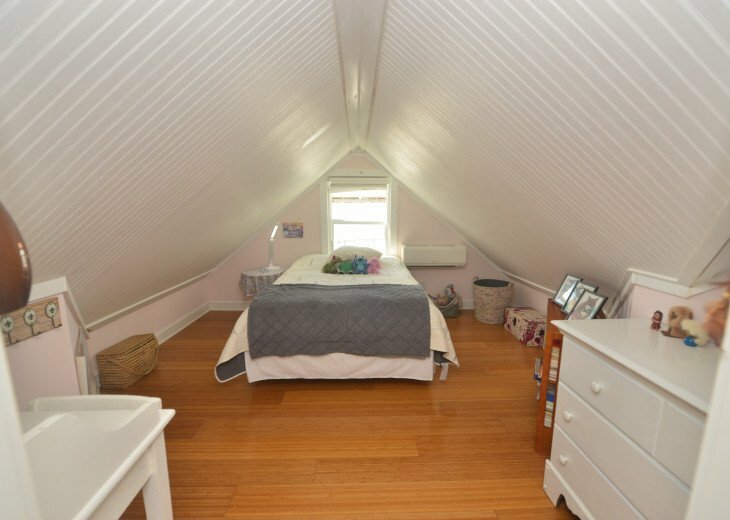 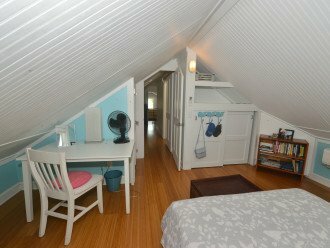 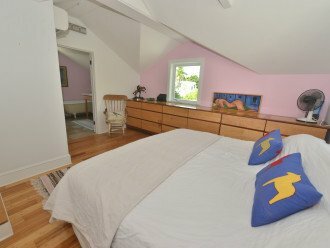 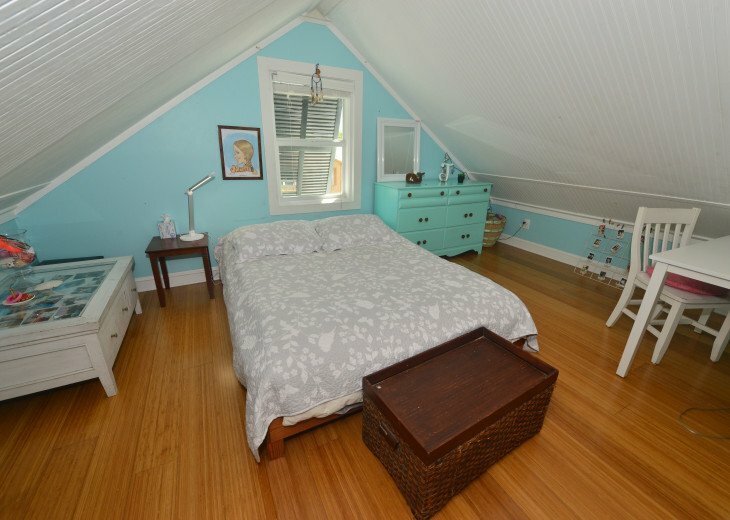 Also the two extra bedrooms upstairs are ideal for kids. 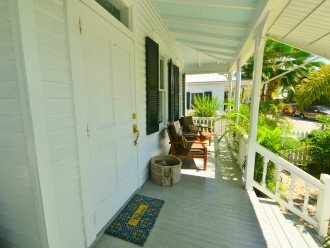 You can walk or bike to anywhere you want to be in Key West. 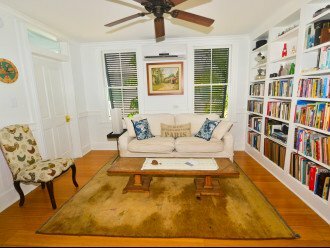 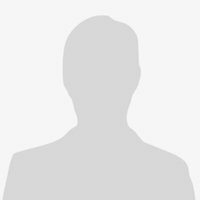 We are close to beaches, state parks, city parks, tennis courts, shopping, restaurants, theaters, galleries, waterfront, fishing and entertaining. 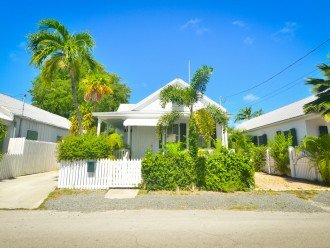 We are only one block away from the main street but it is still a quiet street. 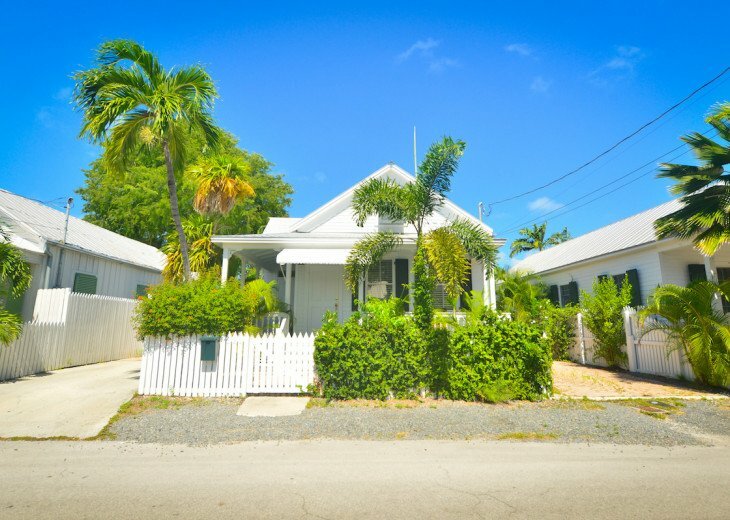 Park your car and hop on a bike! 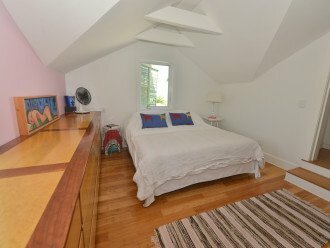 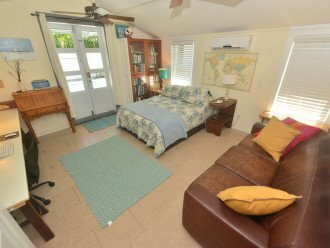 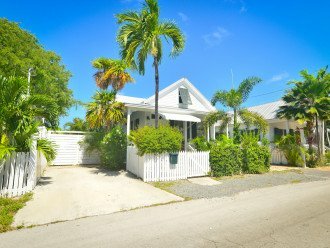 About the owner: Me and my husband met in Key West 22 years ago. 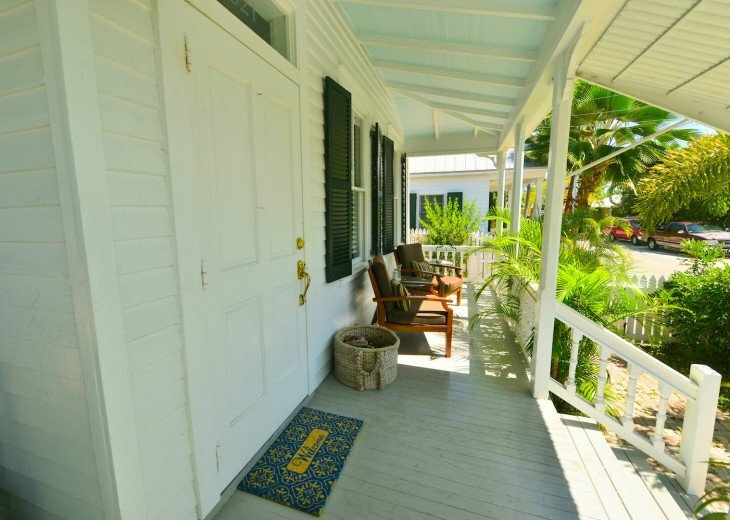 I am originally from Sweden and my husband James came to Key West from New Jersey as a teenager with his family. 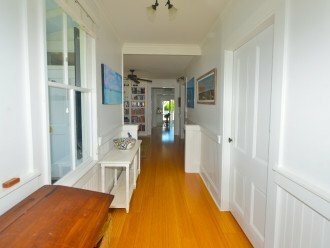 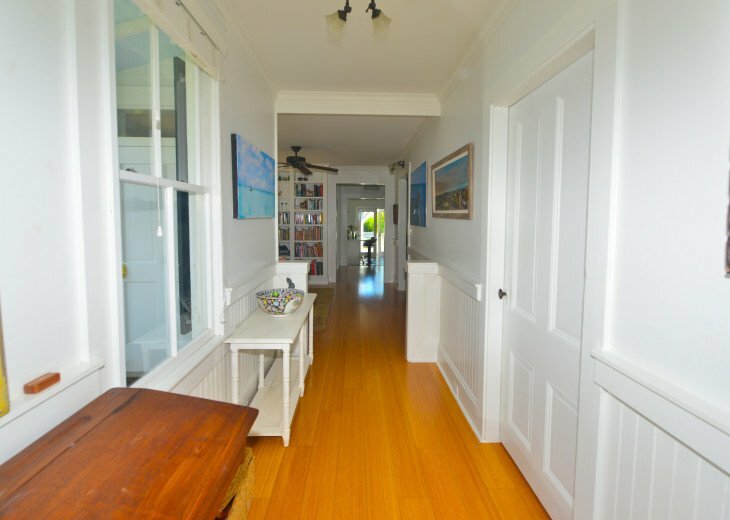 My husband is a builder and has lovingly restored and renovated this house which was build 1914. 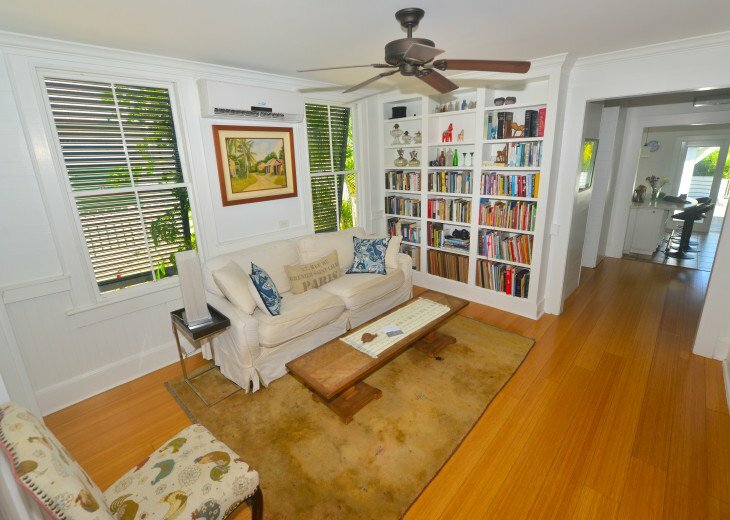 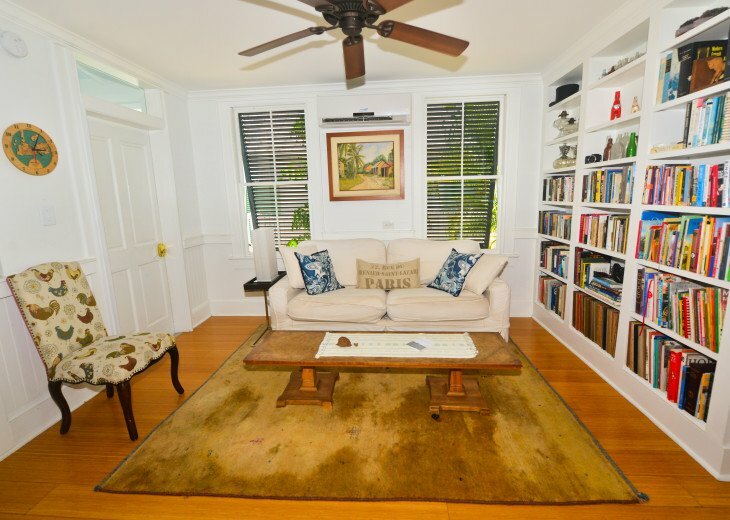 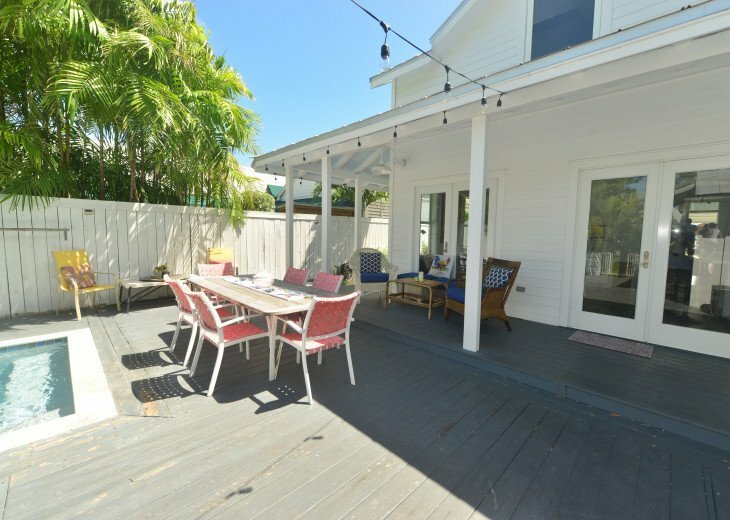 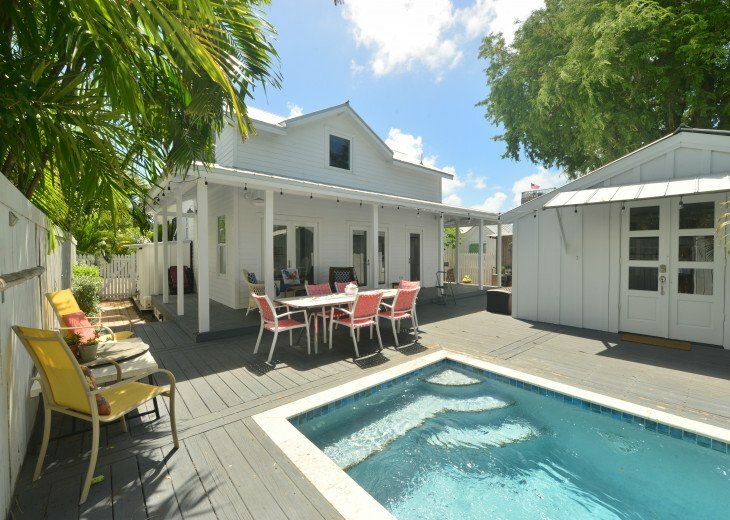 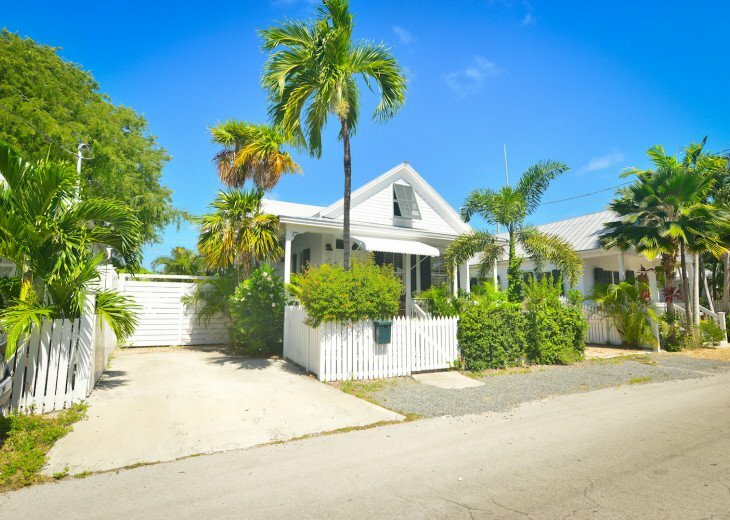 We are now done renovating yet another house in Key West and that is why we decided to rent out this house. We have lived in this house for 8 years with our 3 children and hope that you will love it as much as we do.